King Street Station. Photo by Chris Fussell. Our train station may be a sad one, but it’s ours. Don’t be fooled by a pretty face! King Street Station is a marvel at interfacing with the community. For example, Penn Station in New York was designed to hide the fact that it is a train station. King Street Station openly proclaims itself! The Trains are visible from every where. When you exit, you don’t have to go through a cavern…you pretty much walk right into the center of town. In fact, you can walk into multiple centers — Sodo, ID, Pioneer Square. The clock tower is probably one of the most aesthetically pleasing architectural features of Seattle. It’s proportioned just right. The arched openings on the north side are quite nice as is the mini-plaza. Again, the station is not too monumental nor too prosaic. New York’s Pennsylvania Railroad Station certainly was NOT “designed to hide the fact that it is a train station”! It takes is present form due to the architectural and planning madness that was the 1960’s! Oh my god. I had no idea – it was beautiful. the original building had a room based on the roman baths of Caracalla. the replacement is awful in every aspect. supposedly when they started demolishing the facade people started to realize how beautiful it was and support to save it built up but it was too late. i guess the years of weather/smog made the pink granite dark in appearance and when they started the demolition it showed the original vibrant color inside the cracked granite. I believe the destruction of Penn. Station was the final straw that lead to NYC’s landmark preservation act. New York City seems to go in two opposite directions at once. On one hand, it has the most comprehensive transit in the country, including 24 hour commuter trains to three states. It has the highest percentage of carless households, people move there from all over the country so they don’t have to drive, and even die-hard suburbanites take transit to the city. On the other hand, NYC had the first freeway in the country (except perhaps the Pasadena Freeway), and several recent developments in the Bronx have been pedestrian/transit hostile. It’s like they have everything and they want to throw it away. What are some (relatively cheap) options for making King Street Station at least APPEAR more friendly and connected? Well, here’s one thing they can do: build some escalators and make the route from LINK to bus tunnel more clear with signage. My mistake: I meant to say Sounder to LINK/Bus Tunnel. I think they should work to get a direct pedestrian tunnel between King Street Station (both Amtrak and Sounder platforms) and IDS. That would be great and make it a lot easier to get back home once I get back from Portland or Tacoma. This might be a chicken and egg problem. How safe will a pedestrian tunnel be if there aren’t alot of trains coming and going to make it full. How will you get alot of trains going if people can’t transfer easily? Maybe in the short term a better (more clear?) surface option, with the long term goal of a pedestrian tunnel? Yeah I think signage is the best starting point. Take a look a this video. This is a video of the transfer between the Stockholm subway and commuter rail (which comes at least ever 15 minutes). Starting at :30 is the underground walkways that connects to two. Pedestrian tunnels do not feel as safe as overpasses. I think perhaps a covered walkway from the west side of King Street Station to the Sounder footbridge at Weller Street, with lots of signage, would get the job done. An escalator/moving walkway to connect the station with Sounder/IDS would be ideal, thus no need for travelers to schlep their luggage and go outside unless they want to. There could be visible rather than hidden cameras installed to discourage transients and troublemakers to hang around. I’d love to see King St. be more like or stations in the UK, where light rail service is contained within, or directly connected to, the intercity and commuter terminal. Could Link platforms at ID ever be directly adjacent to Amtrak and (all-day) Sounder service? Is it even possible (tide flats etc..) to open up the area under 4th Ave S to create one platform area? Poor editing…it was supposed to reference Manchester’s Victoria and Piccadilly stations. You could probably put 4th on stilts to create more platforms, but the basement level of Union Station is still in the way of a direct connection to Link. Plus, you’d still have to go back up to street level to cross the tracks between platforms. Looking at it, I believe the correct method is to build an overpass over the tracks, with the steps & elevators to platforms right across the freight tracks and across 4th Street into International District Station. Thinking harder :-) I wonder if the overpass on the line of Weller Street could be extended to form a nice walkway to ID station. Perhaps 4th Street could dive to track level and back… It’s a bit out-of-the-way, but it makes for a decent connection to Link if signed properly. The sidewalk across 4th would need to be much improved (and widened), and the “Union Station Parking Garage” would need its entrance relocated. A *parking garage entrance* is occupying prime walking space…. You should be able to enter the train station from the front. Which side is the “front”? The front is the King Street side, the west side. You CAN enter from the front. Does anyone know the status of the train arrival signs on Link? January is quickly coming to a close. Sometime in February, I’m told. I wonder if Brian has the latest on the renovation progress. Signage, I’m sure will be included. I asked if I could have that sign once. They said it to go to MOHAI. Probably not escalators, but elevators for ADA access. I was told there would be no escalators to the Jackson Street Plaza. Are there any updates to share about the noise reduction project? Has it been successful? What’s the current decibel level on those curves between RB and TIB? I know Mt. Baker and Sodo’s curves are still quite loud. I believe they’ve reduced quite a bit. As each train goes in for a maintenance overhaul (based on mileage), the wheels are being re-ground to a new angle to match the track grinding. As that happens, everything will get quieter. To allow for all the trains that wsdot and Sound Transit eventually want to run won’t it require a much larger station with alot more platforms? Maybe more platforms, but certainly not longer ones. The platforms at KSS currently are way long enough to add 2 or 3 cars to a Sounder train. The dead-ending of King Street when it hits Jackson is awful for King Street Station’s connections to the rest of the city. I was thinking, would it be possible (albeit fairly expensive, I suppose) to turn that entire dead end into a grand staircase? Perhaps, to retain access to the loading docks on either side, you could have the middle of the staircase go all the way down and the sides only go down a little ways to allow trucks to get under them. I think that would really help. Also, I just found this page on ST’s website:http://www.soundtransit.org/Working-With-Us/Real-Estate/Transit-Facility-Profiles.xml. A little outdated, but still really cool. They have maps of the station areas of all the Sounder, Tacoma Link, Central Link, U Link, and North Link stations, with land use, zoning, land value, and ownership data. Once the upgrades to the station are complete. It will be one of the best in the country. I agree. they are slowly but surely renovating the inside of the station. the outside looks great! and yes the first impression when stepping out of the station is a bit dire and could certainly use more/better signage, re-doing the way taxis and pickups are situated, etc. i absolutely LOVE the portland station and the various transit connections available outside. the entire downtown transit mall has beautifully designed bus/light rail signs, benches, shelters, etc. The North Qwest Field parking lot would certainly provide a large open area, even grander than the area around Portland Union Station, in fact it does already, its just filled with cars most of the time. But after a beer or two at the Elysian Fields and then walking back to King Street Station across that vast open area, it is striking to see the St Marks like tower with distant walls of buildings lighting up the night. Even Qwest Field takes on a looming presence much like an old European Cathederal. And it only helps if there is a Talgo set waiting to leave for Portland. Heck, even with the cars left the lot, a giant fountain in the center would really make it a great city plaza for occasions when they would just ban parking. Or am I already repeating a plan in the works? i believe the plan for that lot was to put apartments on one section, can’t remember if it was NW or NE. i’ll try and find a link to the news article. seemed like a terrible idea to me. Chetan, what upgrades are in the works? What plans are there to better tie KSS into the transit networks of the city/region? The area that is currently a parking lot in facing 3rd is going to become a plaza with shops and an entrance to the station, the station interior is going to be restored, and there is going to be better signage to tell people where to go. Oh wow, looks like a pretty nice sized little project they got going! It’s huge – but largely unfunded. Try and see how easy it is to get to King Street Station from South Jackson. It isn’t. Try and go to the upper door and find that it’s locked! It was locked to keep the homeless from camping out inside. Part of the renovation is to ‘daylight’ the staircase, as it was originally constructed. Yes, and, although there is a staircase attached to King Street Center next door, it is not obvious from Jackson Street that it is there. And, the staircase curves away from the station instead of towards it, so it is only marginally shorter than walking around the block, Jackson to 2nd to King. The whole Jackson street parking lot has been fenced off for at least the last six months. 1. King County never should have allowed to build King Street Center at 2nd and Jackson. That lot could have been developed into an inviting front yard for the station; with that building in place, the front door of KSS seems like it is down in a hole. Circulation for cars dropping or picking up passengers could have been so much better, using that lot for a loop, instead of the y-turn required now. Yes, they could carve out a piece of the Qwest Field lot for improved traffic circulation, and parking for Amtrak Thruway buses, but the main entrance of the station will always be in a hole, now. 2. The new platform covers, I believe installed by Sound Transit, are utterly out of place next to a classic station like KSS. They might work next to some building with a modern architecture, but their industrial design totally uglies-up KSS, and they should be replaced with something that fits architecturally. They are to the outside what the suspended ceiling is to the inside. 3. I have read that the plan is for a coffee shop to go in to the space on the main floor originally called (I think) the Women’s Waiting Room. That would be a great addition. In my dreams, the second floor space would be turned into a full-service restaurant, with the bar along the railing overlooking the waiting room. Passengers could sit there and enjoy cocktails and appetizers while watching the hurly-burly below and waiting to hear their train called. I’d eat there even if I wasn’t taking a train. I have more thoughts, but that’s enough for now. I think having King Street Center there is a lot better than having a big loop for cars… I agree they need to make connections better, but I have other ideas for how to do that (see my above comment). It’ll be great to have a coffeeshop in that spot. I think they are planning to put in a restaurant in the second floor of the station on the Jackson side, and they are rehabilitating the rest of the space on that and the third floor for offices. I did not mean that the whole block would be a looping driveway. Cut out even just the southeast quarter of King Street Center and you could put a little loop at the front door of KSS, so cars could turn around, and you would not have that car clog that happens several times a day. But I remember when the block was a parking lot, and you could see the whole station from the west and northwest, and the entrance had a more open feel to it, because there was not the bulk of King Street Center looming over it. Go back in time, and take away the King Street Center, and you could put a car turnaround, and a small transit center, and a staging area for the Thruway buses there. And maybe a patch of grass and a fountain and a staircase. It would be much more open and welcoming. Can you identify the transit facility in this photo? For extra credit, how about the gambling facility? That would be Sumner Station if I’m not mistaken. Last year I could swipe my vanpool pass on several ST routes operated by Metro (565, 577, 550). The vanpool pass was good for $2 ($72/mo), so I would just drop an extra 50c in the fare box. Earlier this month I tapped my pass on a Metro route (177), and it took 50c from my E-purse, indicating that my vanpool pass is accepted. But on a Metro-operated ST route (550), the entire $2.50 was taken from my E-purse. ORCA customer service tells me that that’s what’s supposed to happen, as the vanpool pass is good only on Metro routes, not ST routes operated by Metro. So either (a) the couple of drivers who last year affirmed I could use my vanpool pass when I asked were wrong, as well as the many drivers after that who let me swipe my vanpool pass without blinking, or (b) this is an unannounced change. It’s ironic that the transition to One Regional Card for All would narrow which buses I can use. 1. Should a vanpool rider get any kind of credit on a bus pass or discount on bus fare? Why or why not? 2. If so, should the credit or discount be restricted to a particular set of routes? Why or why not? To answer (a) they probably didn’t notice what type of pass it was. Also, too many people don’t understand the difference between Metro and Metro-operated service. Metro service is 100% Metro. Metro-operated service is about 25% Metro. Sound Transit owns the buses. Sound Transit pays for Metro to fix the buses. Sound Transit pays Metro to drive the buses. Sound Transit pays metro to empty the farebox and put it in Sound Transit’s piggybank. So even though the operator might be wearing a shirt that says King County Metro, they are in fact working for Sound Transit. It’s cheaper for ST to leverage an existing workforce rather than hiring their own, and Metro also benefits from this. One quick example: one employee could drive ST routes 3 days, and Metro routes for 2 days. So since you’re paying Metro for the van that’s sitting in your pool (just kidding), it’s a nice gesture for them to pay the base fare on one of their buses. I’m really not surprised that they don’t pay someone else when you ride their bus. The PugetPass is different. It’s a regional pass–not an agency pass. Related to #2, how does a casual rider know what route is operated by which agency? Is a Metro-operated ST route signed or liveried as Metro or as ST? As a casual transit user, prior to ORCA and the elimination of interagency transfers I never knew such X-operated-by-Y routes existed. Considering there are dozens of such routes out there, it seems likely that a lot of people are running into problems like yours, and for reasons that don’t really make any sense to most folks. For ST buses, look to the letter next to the coach number. However, the agency that runs the ST route doesn’t matter at all in terms of how you pay, what you pay, when you pay. ORCA is supposed to be replacing the vanpool pass. At least you won’t have to go through a 1-hour process to get your picture taken for a reduced-fare pass or stand in a 2-hour line with people who don’t realize they could buy an ORCA card at the (Card &) Ticket Vending Machine. Well it’s finally happened – the Las Vegas Monorail has officially gone bankrupt. But here in Seattle? Not a word in the press or the forums. Given all the intellectual and physical capital that this city has spent on our own monorail expansion plans (now failed), you’d think that someone would at least notice. At the very least, I’d expect the failure of the Las Vegas Monorail to have an impact on some of the more “creative” funding options people occasionally suggest here in Seattle. Well the Las Vegas Monorail was a private enterprise, and I don’t think it was taxpayer-supported at all. What you say is not exactly true. The LV Monorail was actually financed with $650M in tax exempt bonds issued by the State of Nevada – it probably would never have been built it not for this government support. Some of the creditors are now saying that the LV Monorail is really a government agency and therefore the government (taxpayers) needs to cover the loss. It will probably take years to sort out the financial mess. if ONLY the monorail made it to the airport it would definitely be in the black. Hmm $5 monorail ticket or $30 cab ride? Hopefully this bankruptcy won’t deter airport plans!! I don’t think going bankrupt on phase I will in any way increase their chances of raising an additional $500M (?) for phase II. Nothing scares off investors like a history of bankruptcy. Particularly now. The Las Vegas Monorail is one of the few examples of a private entity trying to provide public transit, and a great lesson in the hell that prevents more private businesses from doing so? And just imagine if we built transit here that covered 100% of Operations & Maintenance! There’s nothing all that “creative” about it. They’ve been trying to cover O&M and pay back all capital expenses, and do so in a down economy when folks aren’t quick to travel to Las Vegas and drop money, and they have not succeeded. It’s a cautionary tale, to be sure, but not really that spectacular. If the city knows what’s good for them, they’ll kick in some taxpayer monies to help support it — and then extend it to their airport. I’d like to propose that the countdown clock on the right be temporarily changed to reflect the last day of the KCM 194 bus. It’s cancellation is a sign of progress! You’re likely to rouse a sleeping Renn-Dawg with a comment like that! So the 76 and 77 are moving to the tunnel, but not the 79. I know the 79 has lower ridership (usually 35 or 40 foot Gilligs) but it shares routing with the 72 and would make a great compliment to peak hour service for those travelling between downtown and the UW (albeit many of them would be going the opposite direction). I rode the 79 once. Kind of a weird route. But I’m excited about 76 going into the tunnel. Goes right by my house, so now I’ll have even more options for getting back from downtown at peak. I wish Metro would put stuff on their website earlier than a couple of days before the service change. Sure I can look at the run cards, but that doesn’t tell me everything. This excites me. I remember when I was 11 years old (1991), walking into King Street Station, realizing that there was a grand ceiling above that horrible suspended ceiling, and thinking “Wouldn’t it be great if they fixed this place up to what it used to look like!”. And now they are. Awesome. Those two buildings across from King St threw me off. The 2nd Ave Extension wasn’t there at the time. It’s sad that some of the buildings there were demolished and replaced with parking lots or crappier buildings. The linked to article praises Portland’s station over Seattle. Until the Green Line opened in September light rail came nowhere near Portland’s Amtrak Station. Seattle is getting right the first time around by connecting to King Street and the Airport. Being a Snohomish County resident myself I’m rather proud of the multi-model Everett Station. Everett Station is great! Sadly, it’s not exactly a walkable area. My blog post “The tale of two train stations” is linked to “sad one” at the top of the page. My wife and I took a week-long, fully loaded bicycle tour (tent, stove, camping gear, etc.) within the city limits of Portland. Over 200 miles of pedaling in the city, with light rail as an easy second travel option. Here is a link to the show I did with Steve Scher on Weekday about it. Having lived, walked, bussed and biked in Seattle for 25 years, what I was most impressed with in Portland was the focus on people instead of cars. Over the last twenty years, Portland has focused on a network of connected routes for people–bike paths, sidewalks, bike boulevards, etc. The signage is so well thought out, that often we didn’t need to refer to our map to get where we wanted to go. Portland has done a great job of “the last mile”, getting people from their homes to a bus stop or light rail stop without having to drive. That means safe and clear routes for pedestrians and bikes. That goes for travelers too. In Portland, if you arrive on Greyhound, you have a two minute walk to the AMTRAK station. Here in Seattle … see how long it takes you to get from Greyhound to AMTRAK. Try walking it sometime with a couple of bags of luggage … or without local knowledge, figuring out what METRO bus will take you there. We have sidewalks and bike paths and trails here … but they often are not connected. Seattle has lots of opportunities to use a bike for recreation, but not for transportation. That’s why you see so much lycra in Seattle. Sure, we have diehard commuters on bikes, but your average citizen is too intimidated to ride a bike around the city. Portland made a commitment years ago to focus moving people and not cars … and it shows. We’ve talked a lot about it here in Seattle, but our progress has been painfully slow. I believe we are on the right track. I’d just like to see us pick up the pace. We don’t need to copy Portland. But we should be inspired by what they have accomplished. 200-foot blocks, plus the garden or park blocks (save for the ones sold off, grrrrr!) sure help Portland. Those two decisions alone, made over a century ago, are two significant reasons Portland is such! 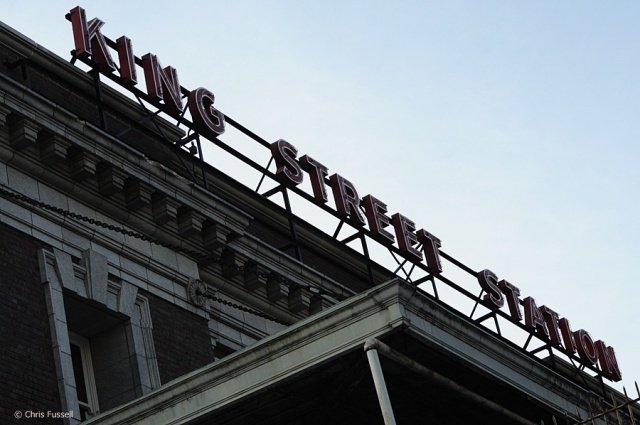 Thanks for your continued interest in the King Street Station Restoration Program. All of the elements of the restoration program are separated into phases. We completed Phase One in the summer of 2009 which included repair of the station’s roof tiles with new ceramic tiles, replacement of the glass pyramid above the clock tower, repair of the finial atop the pyramid, and repair to the four clocks in the tower. Phase Two begins this year and will include structural and seismic retrofitting work on the Jackson Street Plaza, removal of non-original additions to the west and south sides of the building, and removal of the false ceiling currently displayed in the station. A section of the original ornamental plaster ceiling will also be restored at this time. You can follow the progress by checking the project website for updates (http://www.seattle.gov/transportation/kingstreet.htm). I have attached the latest update to this message. If you have any other questions, please feel free to let me know. By the way, I was also emailing Grace before she left and she was saying that the city was working with Greyhound so that the new terminal might be located in the ID. Since the old Greyhound building will be torn down in a few years, once the economy turns around, they wanted to have most transit connections in the ID area (local/commuter/passenger bus, light rail, streetcar, commuter/passenger rail) with connections to the ferry and monorail. There is some vacant parking lots around 5th and Jackson so I hope they can pull it off. Once this entire project is done, it will be a model for the entire country and be on equal and maybe higher ground than even Portland. I hope the new Greyhound Station won’t be surrounded by a parking lot and will be done in a way that integrates with the neighborhood. Maybe they could even have the buses go up to a second level and have retail on the ground floor. I had thought that part of the King Street Station rennovation plan was to make the upper level plaza off Jackson St. be a bus dropoff/pickup area. And I thought that the ID/Chinatown area nixed that for fear of bums and transients? That location of the old ID building would be near perfect for Greyhound. Easy freeyway access, One block from the Union station tunnel for LINK, two blocks to King Street. But even if that not “the” location, there are a couple of other low density buildings on South 6th that would be nearly as close. I hope the old Greyhound station isn’t torn down. It was built as a terminal for the then PSE owned Seattle-Everett and Seattle-Tacoma interurban. It may not quite be National Register material but it could be a fairly nice old terra cotta building if it was fixed up. Sorry, I didn’t mean to say that the old Greyhound station would be torn down. I meant to say that it will be turned into condos or apartments. I believe they decided to keep the building after everyone screamed. The old Greyhound site is scheduled for Hedreen’s 50 story hotel development. I’m pretty sure they won’t be keeping the station. Maybe he means they will preserve the facade like on some of those SLU buildings? No. The Landmarks Preservation Board rejected the Greyhound station for preservation in Feb 2008, because the remodel in the 60’s had ‘compromised the architectural integrity’. The proposal for 811 Stewart (below) shows a completely new design and the DPD website notes “existing office structure and bus station to be demolished”. I think the biggest constraint is the entrance to the BNSF tunnel under Seattle. If it were moved west then they could put King street station on the east side of BNSF main line and connection to buses and Link would be greatly simplified. oh yeah and the rumor is that the awful drop ceiling at the king street station would be taken out around the 1st of april. can’t wait. Cool! I wish the city were more forthcoming about stuff like this, as there are lots of people in town who are really excited and enthusiastic about this project. It would reflect well on the city, as well as being a real morale booster, especially for the Pioneer Square neighborhood. While it will look really weird until they can restore the walls below the drop ceiling, I think they should have/could have done this part long ago – if for no other reason than pure public safety: Those panels in that drop ceiling are metal, and the edges are sharp! That’s about the last place I’d want to be in an earthquake. Speaking of the Pioneer Square neighborhood, I think one of the problems that area is having is the lack of the Waterfront Streetcar. I think the new mayor is starting to get on board with the idea of bringing it back. I’ve had a few emails from his staffers about this possibility. I credit people on this board for that. Good. Turns out a friend of mine has a small subcontracting job on the renovation. He’s promised me that I can carry a clipboard and look like his assistant when he does his site survey. I’ll get to see everything including the tower. Hopefully the ceiling will be down by then. They are going to be making molds of a lot of the plaster work, then demo-ing a lot of it so they can add structural steel for the seismic upgrade. They’ll then put new plaster back using the molds they made off the old plaster work. It should look “original” when they are done. Can I pass-back with an e-purse? I don’t see any reason why it shouldn’t work, but lately I’ve had a couple of bus operators tell me it can’t be done or they’re not sure how to do it. I made an inquiry about this last summer. Mind you, this was prior to the ORCA system conversion so I don’t know if anything has changed. fare, THEN you can tap once for all of the fares. No – the driver selects a screen, chooses the number of passengers of each type (adult, youth, senior/disabled) that are boarding, and then the passenger taps ONCE. Even with an e-purse, your Orca card will register “Pass Back”, as the transfer registers on your card. Apparently when a group fare is paid – the passengers are not issued an electronic transfer as with an individual fare at all. Are they working on an electronic group transfer? Or is this a job for a “disposable” ORCA card? e.g. tourist/card? Re: changing Orca to give group payment the same type of transfer that individual payers get – I’ve asked the Powers that Be (using the usual channels) and have gotten back only cricket noise and the distant echoing sounds of heads being scratched. Ditto my question on why an Orca card expires (requiring a second full fare) 2 hours after issuance, even when the normal transfer route is running late and a paper transfer *would* be accepted without further payment. Ditto my question about why no e-transfer is recorded on the Orca card when a customer uses their Orca card plus cash to pay their fare. Lots of crickets. Lots of heads being scratched. These are the crickets at 2nd and Jackson, right? Or are the ORCA cricketes at 4th and Jackson?? Thanks Charles and Jeff for the help. Nothing on the PI or Times yet. I’m shocked the Times didn’t put up something IMMEDIATELY with a comments section and Link bashing. At the very least, a centralized information and alert structure would be most welcome. A Sound Transit RSS Rider Alert doesn’t do any of us a damn bit of good inside the tunnel. What’s funny about Metro’s response is the fact that Metro operates Link service for Sound Transit. The bus, tunnel and Link coordinators share the same facility. Tunnel buses share the same radio channel as trains in the tunnel. It’s inexcusable that there’s no communication. They have the tools and means, they are just not using them. Wait, what happened to those pusher trucks Metro used to station at each end of the Bus Tunnel? Customer service at its VERY best – are they taking lessons from Amtrak? I resent that. while not perfect I think we do a pretty damn good job considering we have no extra engines, run on someone else’s tracks, etc. Does anyone know whether Sound Transit is abandoning WiFi on Sounder, or are the months of outages a budget/priority issue, or ??? Seems like most trains have maybe one coach left with working WiFi, and when an entire train-load of commuters connects through that one coach, throughput is slower than my old acoustic-coupled modem in BBS days…. Metro abandoned onboard Wi-Fi a long time ago. The technology isn’t ready. By a long time, you mean about a year ago. I used it all the time when I ride the 255 and miss it. It was great! On the user-side, I didn’t had many problems with it. The speed was decent and I was able to carry an instant-messaging conversation on the bus, check my e-mail, and read this blog. I thought it was more a budget thing than the technology. Many intercity bus services have free Wi-Fi and advertise them. Even Amtrak Cascades will be getting Wi-Fi access when they upgrade the trainsets. What do you mean not ready? I happily used wifi on a bus from Washington D.C. to NYC. if you mean, the 3G cell signal isn’t available where Metro and Sound Buses go, then that’s another story. Me thinks them abandoning this is more a budgetary/management problem. It seems to work well enough on ST bus routes, and worked very well on South Sounder when maintained. I just use my Clear Wimax USB modem. Works great in Sounder and Metro buses. WiFi via the cell network really sucked on the north Sounder. It wouldn’t work between Edmonds and Interbay. Dumb question but it’s never come up for me before: Do the Night Owl routes make all posted stops? I think they just stop anywhere, because the 83 goes on a street that doesn’t have any bus stops on it but I’m pretty sure it’ll drop off/pick up anywhere along there. The 83 makes lots of other stops. Metro has Night Stop, which allows you to ask to be dropped off anywhere along the route after 8 pm. Yes, so long as there is someone waiting at the stop (and visible) or someone wanting off. Why wouldn’t they? I only ask because they don’t put the numbers on the bus stop sign. Like I said, I knew it was a dumb question but I’ve never had a reason to ride one until next week so I wanted to make sure. They do make all stops but make sure you are visible to the driver and obviously waiting for the bus. There are some stops on those routes that have probably never seen a night owl rider. I nearly had to jump in front of the 82 one morning! They don’t put the night owl numbers on the stops but they do put the schedule in the schedule area in some places. Watch out for the numbers at SeaTac Station by the way. When I was there in December the numbers were totally different than the buses that stopped there. It is strange though that the 280 doesn’t pick people up at either Kennydale or Newcastle. Why make those drop-off only flag stops? Bellevue City Council Member Kevin Wallace is making his pitch for the “Vision Line” on the Times today. In the interest of making lemonade out of lemons, I hope someone can get him to consider the need for a rail/bus omni-transfer center as close to I-405 and I-90 as possible, and suggest that an elevated light rail line bisecting downtown Bellevue would not be much more expensive than his Vision Line having it at the far east edge of downtown Bellevue. Looking at the map, I think we should remain open to the BNS&F corridor outside of downtown Bellevue if the omni-transfer station could be done, and the line detour aerially through the heart of downtown. While South Bellevue P&R is clearly a better multi-modal transfer point than Wilburton P&R would be, building a transfer point right around where the future eastside commuter rail line crosses the path of the Issaquah rail line would be the best long-term investment. An onmi-transfer station at I-90/405 would be incredibly difficult to construct and operate. BNSF at that point is at least 40 feet above I-90, so any station above I-90 (in order to facilitate connections with a future Issaquah line) would have to be on top of pretty tall supports. Plus 118th at that point has no east-west road connections, so setting up bus transfers—even to Factoria, barely a half mile away—would be very hard to do. Alternatively, is there a way for passenger rail from Bellevue to Renton to go south from South Bellevue P&R? Elevated light rail jogging out to serve Factoria, Newcastle, and Renton Highlands before going down into Renton and Burien..
East Link should go through DT Bellevue, and in the future BNSF rail could transfer at Overlake Medical Center. It’s a closed overgrown ramp that’s been that way since 1993. Why haven’t they ever bothered taking it down? Why was it even closed in the first place? Supposedly it had too many accidents. I guess the ramp was too short to get up to highway speed. They’re doing a lot of work on Spokane Street right now; I wonder if they’ll remove the ramp as part of it. From what I recall of the current expansion plans, they should be building a 1st AVE exit from the top of where that ramp leads to and demolish the 4th AVE exit. I guess they could use that aging ramp to bring up construction vehicles if necessary. I always thought it was an oddity seeing that closed ramp and wondered if they’d ever reopen it or just demolish it. The ramp was closed after a fatal head-on collision (a car had to swerve to avoid colliding with a truck that was merging onto the viaduct and ended up going into oncoming traffic (there was no barrier at that time)). The problem with the ramp was that there is no merge area (you had to merge the instant you got to the top of the ramp). The ramp will be removed as part of the viaduct widening project (the 4th Ave offramp was just closed). The 1st Ave onramp will be removed in May (a new on/offramp will replace it and will open Fall 2011). I want STB to write a post on the similarities and differences between Swift and RapidRide. While not enough, there are significant funds going into King Street Station (purchased by the City in 2008) restoration from the Bridging the Gap levy, federal and state grants. The clock tower and clock have been restored and significant interior work is slated this year. Thank you Mr Mayor! I hope you come back to Seattle from Harvard soon. The King Street Station renovation project has been an important part of your legacy and those of us who have followed its slow progress are indebted to you for following through on the need to restore this important gateway to Seattle. there’s no way this is actually greg nickels! As most folks know from my comments on this Blog, King Street Station is a pet project of mine. The outside of the station now looks great and hopefully the inside will mirror this in due course. It has been a long slow climb, but hopefully will be worth it in the end. Tim, I absolutely think it will be worth it in the end. The City and the region all benefit from a clean, restored King Street serving as an important piece of the transit circulation system. It’s clear from previous comments that there are things we can do to make the connections to/from better, but just getting the building itself back from the horrible past “remodel” and “upgrade” is a huge win. Short answer is I think “Nope”, though some of the structures still exist. St. Louis retains it’s train shed, but the train’s don’t run to that station. Same in Philadelphia where a train shed is now part of their convention center. Now a part of Liberty State Park in New Jersey. I hope Mr. Former Mayor is having fun in Cambridge riding on the “Trackless Trolleys” and checking out the Red Line, the Green Line as well as the rest of the “T”. Does anyone know if the airport has good sinage to get to Link? My parents are flying in for a visit this week, and I need to know how much instruction I’ll need to give them to find the station. I used Link to get home three weeks ago. There is good signage in the baggage claim area that leads the way to the station. If you tell them to follow the signs to the parking garage and walk north they cant miss it if they do not go to baggage claim.